The third-level students had brought enough food to last several weeks – and a portable toilet – but left the building when Gardaí arrived on the scene. 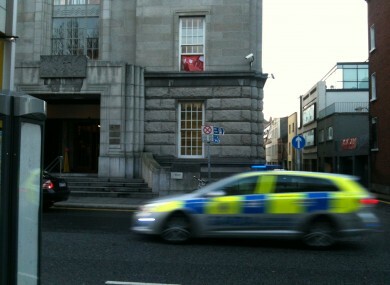 A squad car passing by the building on Kildare Street just after 3.30pm today. The USI banner is visible in the window. A NUMBER OF students briefly occupied part of the Department of Jobs and Enterprise in an anti-fees protest this evening. Members of the Union of Students in Ireland (USI) had planned an extended occupation of the building in Dublin city centre, but left when Gardaí arrived on the scene. The students had brought enough food with them to last for several weeks – as well as a portable toilet – to the government ministry on Kildare Street in Dublin. It is not known if Richard Bruton, the Minister for Jobs and Enterprise, was in the building at the time. A spokesperson for the department told TheJournal.ie that the occupation had lasted ten or fifteen minutes and ended when the students voluntarily left the building. USI president Gary Redmond said that the protest was to call on Tánaiste Eamon Gilmore to clarify the Labour Party position on third-level fees. Speaking earlier to TheJournal.ie, Redmond was critical of the Labour Party, saying: “Students have had enough, and they’re going to stay in the building until the Tánaiste comes and clarifies the position on fees”. Redmond said that the government parties were rolling back on their pre-election promises not to introduce third-level fees. A tweet from the University Times, a student newspaper in Trinity College Dublin, suggested that the group would now attempt to occupy the Department of Social Protection. Earlier this month 20,000 students marched in Dublin city centre against the possible reintroduction of third-level fees. Email “Students briefly occupy Department of Jobs in fees protest”. Feedback on “Students briefly occupy Department of Jobs in fees protest”.